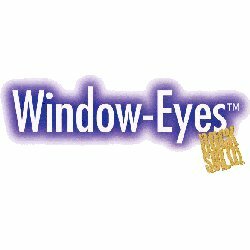 Window-Eyes is compatible with Windows XP, 2000, 9x, ME. You have control over what you hear and how you hear it. No need for scripts or macros and performs with most applications right out of the box. Support for Speech Synthesizers, Braille Display, Grade 2 Braille, Internet. A long list of screen reading capabilities from support for all video systems to passwords to reading progress and scroll bars.